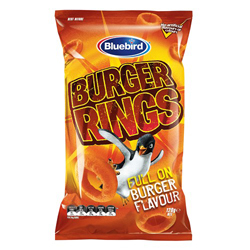 Bluebird Burger Rings are puffed corn snacks packed full of flavour with an amazing burger taste. This 120g bag can cure the biggest craving for a snack. Bluebird are proudly kiwi and proud of their Burger Rings. E110,E102: may have an adverse effect on activity and attention in children. Burger rings are one of my favorites! I'm so glad to be able to find them online to get them shipped to me! Thanks you! Got a complimentary pack with an order and will now probably need rehab to overcome what I think may be the start of a serious addiction! Tastier than you can ever imagine. these are by far the best "crisps" iv ever tasted and the main thing i miss about nz!! if you've not tried them yet they are a must!! a delicious kiwi morsel oh burger ring! We recently went to the Anzac Sports Challenge Day on the 2nd of May 2009, where there in the distance was the Sanza Food Stall. Oh what a delight to the Kiwi's and Aussie's there that day. I overheard a lot of people talking about how amazing burger rings were of course i already knew this... we polished off two bags of 150g burger rings at the rate of one bag per five minutes. They are extremely addictive and very easy to eat! Incredible flavour, you HAVE to try these they are just amazingly tasty, they'll leave you wanting more and more. Put this on your food "bucket list" mmm burger rings! !